1) Where you told about about Apprenticeships as part of your careers guidance? Which has 9 actual replies including the helpful from recent school leavers who all reinforce the line that Apprenticeships were offered as an option for students with expected lower grades and the not so helpful (“I was shipped off to fight in **** holes across the world. So, no.” – ok chief, thanks for that). 2) Who should provide information about Apprenticeships? Which has a small number of contributions from 4 posters who all suggest that there should be a central online portal for young people to access apprenticeship vacancies. The marketing team at NAS, to the back of the class with you immediately. 3) What did you get out of your Apprenticeship? Currently overflowing with the grand total of 3 responses, all of which has positive feedback from posters regarding their Apprenticeship experience but perhaps the lack of response to this question might reinforce what the Committee already knows. There just aren’t that many young people completing Apprenticeships. 4) Why do an Apprenticeship? What puts people off? They are seen as being low paid, because nobody realises/cares about the qualifications. More needs to be done to highlight the issue. Going to uni gets paid nothing (well, you get a loan to pay back, and sometimes grants) but most people don’t say they’d be better off working in Tesco than getting a degree. But I think this is part of a wider problem, in that unless you have parents to support you an apprenticeship is not an option. You’re generally not eligible for a student bank account with overdraft, and can’t live in student accommodation. Some apprenticeships will provide accommodation, but probably most don’t. So for people from low-income families it’s unrealistic – their family can’t support them whilst they earn £2 an hour. I hope that what little response they’ve had through this route doesn’t put the Committee off in future trying to access young people’s views using non traditional routes like this and the small nuggets of insight they have received are useful in guiding their recommendations. A 140 page research paper from the Department of Business, Innovation & Skills isn’t something that would usually take up my reading time the week before Christmas but I made a special exception this year as a) it comes at a time of positive change in the sector with news of a new all singing, all dancing Careers Company and b) I was interviewed for the paper and my school gets a mention (cough, page 112, cough and in the interviews from page 46, further cough). With the announcement of the new Careers Company whose role it will be to try to co-ordinate the sporadic, tangled and often overlapping interactions between schools, employers and the National Careers Service (and all of the organisations in-between those gaps such as EBPs, new versions of EBPs, guidance providers, careers resources providers, national schemes etc) the findings and conclusions of this paper will be required reading for Christine Hodgson, Head of Capgemini UK, who has been tasked with leading the new Company. All of the schools in the case study section (pages 110 – 115) have a Careers lead in their establishment. That role requires a Head or Principal to a) fund it and b) think CEIAG is important enough to fund and staff in the first place. That importance and funding seems to be hitting a breaking point for work experience for KS4 though. The Wolf report is still being used as a white flag for cash strapped schools to retreat from offering this provision. Schools want brokerage (point 6, page 6), they want local cohesion and organisation. Employers also want this (point 3, page 5) as it would lower costs and efforts their end. Employers don’t even know the National Careers Service exists (point 8, page 6) so before it is expected to fulfill lots of new tasks, some work on spreading the word needs to be done. The numbers of employers involving themselves with engagement activities other than work experience is pitifully small (table 3.1, page 21) and by far the largest initiator of those activities was the employer being approached by the school or college (table 3.2, page 22) rather than the employer offering something. Lots of schools nagging employers leads to the disjointed landscape we have now and, again, local brokerage could begin to untie these knots. More than half of employers had never engaged with education (page 25). There’s a massive job of persuasion still to do especially with SMEs. Already existing local business networks such as Chambers of Commerce are still pretty untapped by schools looking for employer engagement (table 4.3, page 37). It’s pretty clear what brokerage role schools want from a National Careers Service with expanded duties (page 51) which is also what the Service wants to do but doesn’t have the cash (page 56). Employers see Local Enterprise Partnerships as having a key role in local brokerage (page 75). Schools really want clear LMI to help guide their students (page 75). It will be those findings that (should) shape the tentative steps of the new Careers Company in the new year as it begins to lay out the structures and frameworks that will help organise and standardise employer engagement at regional and local levels for schools and colleges. There was lots of news and buzz this morning as BiS announced that the 2 millionth apprenticeship had started since the last general election. 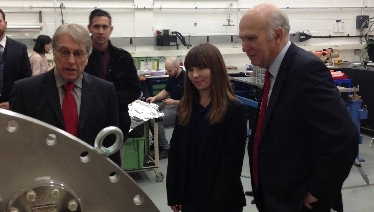 The Department for Business, Innovation and Skills has revealed that 16-year-old Paige McConville became the 2 millionth apprentice when she started an advanced apprenticeship at high-tech engineering firm FMB Oxford in August. Many congratulations should go to Paige for securing what, I would assume, would be a very sought after position. It would be fair to say though that, as a young, female apprentice in a STEM industry attempting to redress a gender imbalance, she does make the lives of the press release team at the Department for Business, Innovation & Skills extremely, shall we say, easy. It’s worth pointing out that, in 13/14, Under 19 Advanced Level Apprenticeship starts were 34,800 out of a total of Under 19 starts of 117,800. Which makes Paige as an Under 19 start one of the (just over) 27% of total starts and, as an Under 19 Advanced Level starter, one of (just over) 8% of total starts. Kick back BiS PR team, your work here is done.